A few weeks ago on our last post we showed you some of the small details that were beginning to come together. Here are a few updates on more completed parts of some those projects. You may recall the small sample of ceiling tiles in our last blog post. The 5th Floor of south Centennial now has a full ceiling. 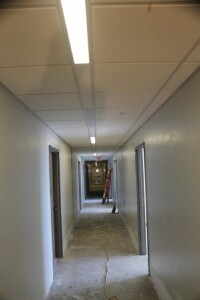 The new ceiling tiles and lighting have been completed and look great! 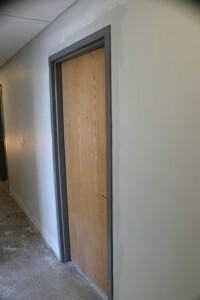 All of the door frames have now been painted the new gray color. The walls will soon be painted as well. When that is completed the door frames will really pop. 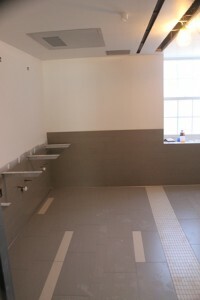 Significant progress has been made on the public restrooms on the south side. Both the tile and the counter-top brackets are in place. Both the men’s and women’s public restrooms will now be located on the south side of Centennial. With the addition of paint and flooring, the 2nd floor laundry room on the south side is patiently waiting for machines to be installed. 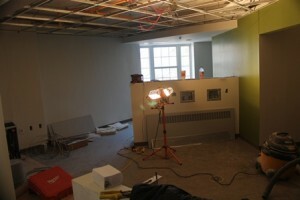 The laundry room will be identical to the 2nd floor laundry room on the north side of the building. A few posts back we showed you one of the spaces allocated for water fountains. These spaces have now been updated. 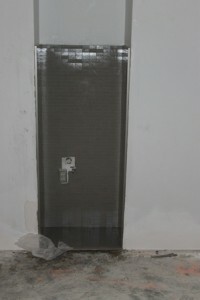 The water fountain areas in the elbows of each floor now have a tile backsplash. The past few days you may have noticed the construction workers in the courtyard on cranes. 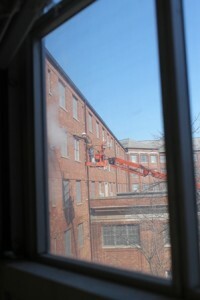 Currently, they are working on cleaning the exterior of the building with the pressure washer. 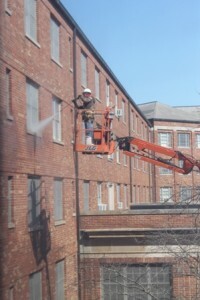 Washing the bricks will give the exterior of the building a cleaner, brighter look. We hope to have more updates posted soon!